Will accept a wide range of frozen foods, prefers chunky foods e.g. Cockle or whole fish. Not recommended, will eat corals, crustaceans, molluscs etc. Temperament can vary, although usually more aggressive as they grow, only house with other fish that can look after themselves, e.g. 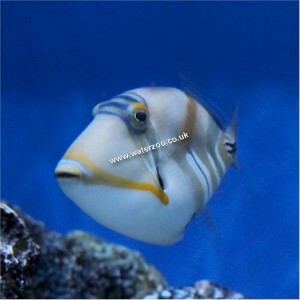 large Tangs, Wrasse, Angels etc. Popular Triggerfish that stays small. 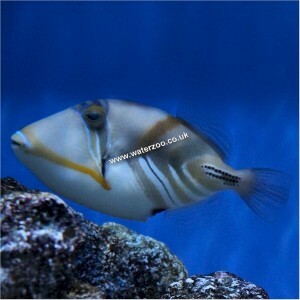 This is a library photo of a 7cm Picasso Trigger taken at The WaterZoo, exact appearance may differ due to natural variations and lighting conditions. Our Triggerfish are hand picked from TMC and rested on our premises for at least 7 days and guaranteed feeding before being offered for sale.